Ticks, the small insects that carry Lyme disease, are expected to be more prevalent in 2017, prompting Ocean County officials to warn residents about the threat. The Cary Institute of Ecosystem Studies believes 2017 could be a bad year – a “forbidding forecast”– for Lyme disease, based on a large acorn crop in 2015 leading to an increase in the white-footed mouse population, county officials said in a statement. Feeding on infected mice is a primary way ticks pick up Lyme and other diseases. Lyme disease is spread by the blacklegged tick, also known as the deer tick, which can be found on the shrubby understory of the forest, in high grassy areas and in open fields. Ticks tend to favor the thick undergrowth of shrubs and small trees because they prefer cool, moist woodlands. They are also found in grassy areas outside homes, and with more residents working on their lawns, homes and boats in the spring, the risk of a tick bite is highest this time of year. Walk on cleared trails and stay in the center of a trail to minimize contact with leaf litter, brush and high grasses where ticks are likely to be found. • Minimize the amount of exposed skin. Wear thick white socks, long pants, and a long-sleeved shirt. Tuck the pant legs into the socks, so ticks cannot crawl up the inside of the pants. Wearing light-colored clothing also makes it easier to see ticks. If you see any ticks while still outside, remove them immediately before going indoors. • Golfers walking through brushy areas should be aware of ticks. • Apply repellents to skin and clothing; read and follow the label instructions. • Products that contain DEET can be directly applied to exposed skin and to clothing to help keep ticks away. The product label will give details about how to apply the repellent and how to use it safely on children. • Permethrin (hunter-grade) products can be applied to clothing/boots/shoes (NOT TO SKIN) and actually kill ticks on contact with the treated clothing. This is usually effective on clothing through several washings. After outdoor activities, be sure to check your body for ticks and remove any immediately. Use a hand-held mirror to thoroughly view all parts of the body. Check children and pets for ticks, also. • Pull upward with steady, even pressure. Don’t twist or jerk the tick; this can cause the mouth-parts to break off and remain in the skin. If this happens, remove the mouth-parts with tweezers. • After removing the tick, thoroughly clean the bite area and your hands with rubbing alcohol, an iodine scrub, or soap and water. • Avoid folklore remedies such as “painting” the tick with nail polish or petroleum jelly, or using heat to make the tick detach from the skin. Health officials also recommend if you find a tick, place it in a sealed container with a slightly damp (with water, not alcohol) piece of paper towel. 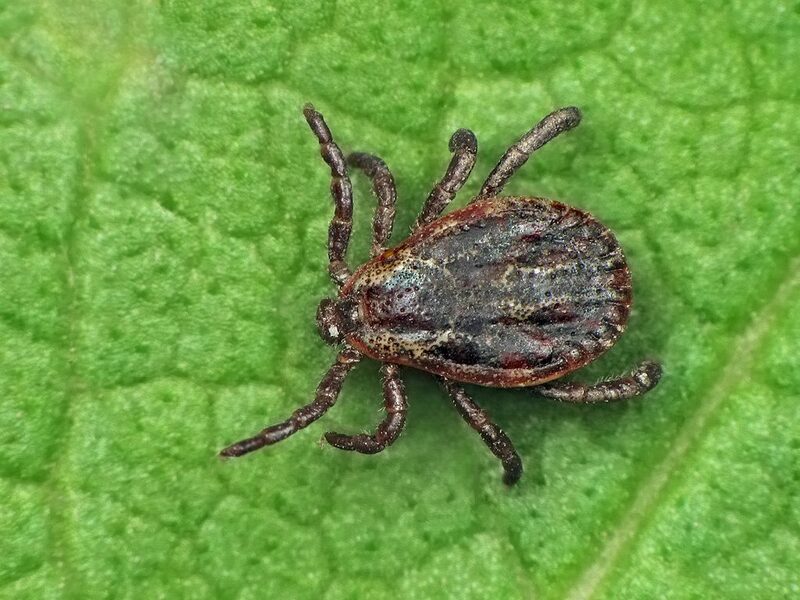 You may take the tick to the Rutgers Cooperative Extension located at 1623 Whitesville Road, (at the corner of Whitesville Road and Sunset Avenue), Toms River, to be identified. Tick experts are available from 9 a.m. to 3 p.m., Monday through Friday to identify ticks. If the tick is identified as a black-legged tick, the staff will make recommendations according to the CDC. The Rutgers Extension also has a listing of labs that the tick can be sent to for testing. More information on ticks, and preventing tick bites can be obtained by calling the Rutgers Cooperative Extension Office at 732-349-1246, or visit the Extension Office website at http://ocean.njaes.rutgers.edu or by visiting the Ocean County Health Department website at www.ochd.org.